All the building plans shown during the presentation are posted on the glass library wall, in the hallway opposite the pictures of the congregation’s rabbis and presidents. We invite everyone to stop by whenever the building is open to view the design. Every so often, an event occurs in our lives that has the power to transform who we are and what we do. Sometimes, it is a life-cycle event – birth, graduation, wedding, even death. Sometimes, it is a life event – new job, relocation, or new home. We write today to share such an event. Our Congregation’s Board of Trustees has approved a “Final Master Plan” for our building’s renovation. 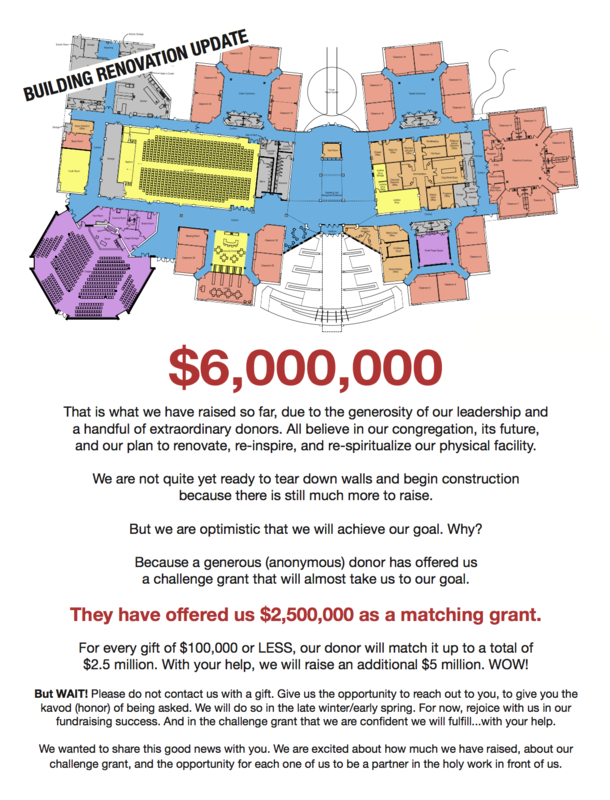 As we have shared with you over the last 18 month, we asked a Building Renovation Task Force (BRTF), chaired by Mary Davidson and Ira Stolzer, to determine the needs for our community for the coming years. They worked with Rogers Krajnak Architects to complete a building analysis (understanding the “health” of our physical structure), a program analysis (understanding the current and future programming needs of the congregation), and a design recommendation to carry us into the future. As you may remember, our current facility was never meant to be a full-service building. It was meant simply to be a school. For the last 14 years, we have been using it beyond its capabilities and we are immensely grateful to our professional staff for making it seem so easy to do so. In truth, it has not been. We have put stress and strains on our building and it is showing its wear. At the same time, we knew that three important elements needed to be addressed for our congregation – increasing security, building community, and enhancing tefillah (prayer). Each needed added dimensions in order to fulfill our core purpose: to nurture Jewish meaning, connection, and continuity. This past week, we took the historic step of voting to accept a design recommendation offered by the BRTF. In our congregation’s 146-year history, such a vote has been passed – perhaps – 6 times. And as it has each time in the past, such a vote propels B’nai Jehudah along a journey of hope and excitement. And change. As we begin the next phase of the work – putting together a Building Task Force and a Capital Campaign to fund our dreams – we ask for your patience. At the beginning of our work we committed to take things one step at a time. That is what we have done. Now, we approach the next phase. That will include many more details that we will share as our process unfolds. Our next step is to share with you the design and its transformational impact on who we are and what we do. We invite you to join us on Shabbat afternoon, January 21, 4-6 pm. We will offer a “seudat shelisheit” (literally, “a third meal”). In our tradition, it is a way to extend the spirituality and communal aspects of Shabbat – two of our goals for this renovation. We will have some light refreshments, some communal singing, a little Torah teaching, and…of course…an opportunity to view the approved design and hear what we hope will happen within our re-imagined space. For those unable to be with us that afternoon, we will record the session and have it available via our website. For now, we want to say thank you to the BRTF. It’s members included Lisa Brower, Bill Carr, Amanda Morgan King, Tim Iseman, Ken Sigman, Donna Thalblum, and Gary Weinberg. Their work has placed us on this path of our journey. It will now be our privilege to continue the journey and the work. We know such a decision carries with it many questions. We are sensitive to the challenges of change. We promise to be in touch on a regular basis, answering questions as we have answers and updating everyone with our progress as we move forward. We look forward to celebrating Shabbat afternoon with you on January 21 and sharing our vision for our future.